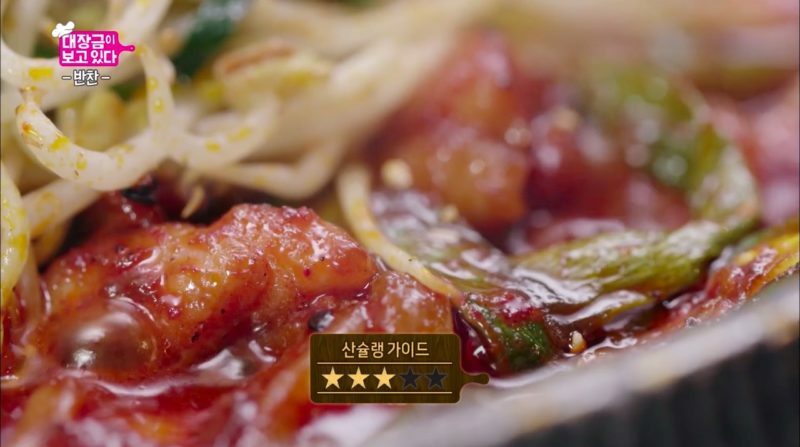 I’m back to continue the roll-call of restaurants found in mukbang-cooking show-comic-Kdrama Dae Jang Geum Is Watching (대장금이 보고 있다)! 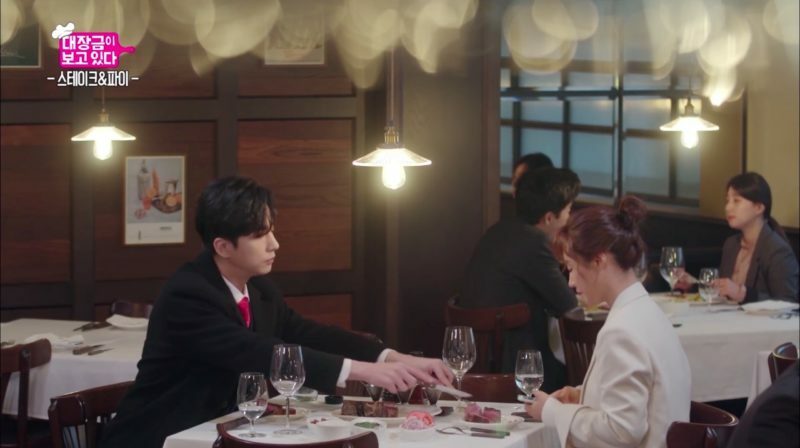 Despite my never-ending late-night cravings (thanks to all the rewatching and recapping I’ve had to do to write Part 1), I’ve managed to power through many mouthwatering moments to bring you the rest of Han San-hae’s (Shin Dong-wook) bucket list. 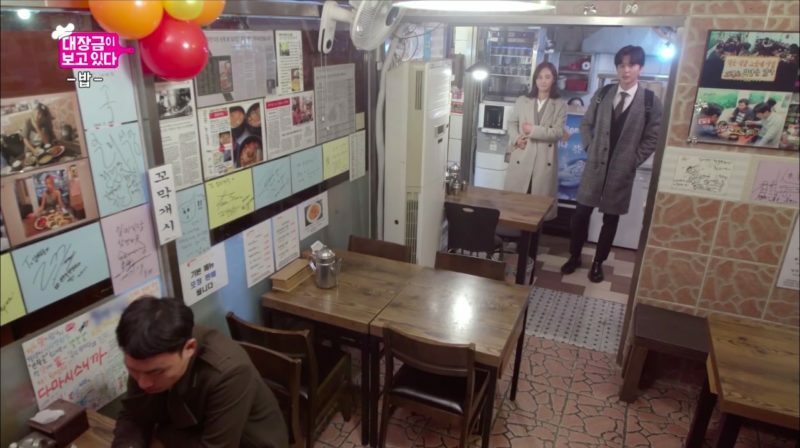 As a recap: this listing of restaurants/eateries seen in the drama comes complete with San-hae’s personal ratings — also known tongue-in-cheek as the ‘San-staurant Guide’ (산슐랭 가이드). Warning: Delicious food pictures ahead; proceed at your own risk, especially if on an empty stomach! Click on the header names to view individual location listings. 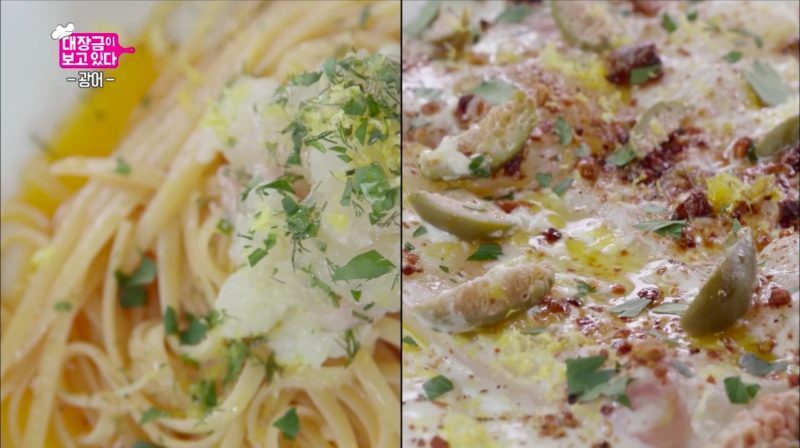 Seung-ah may have been proud to finally treat San-hae to a meal she think he’d like, but little did she expect for him to already have a connection with this eatery, which specialises in Venetian cuisine (and that it was already on his bucket list). 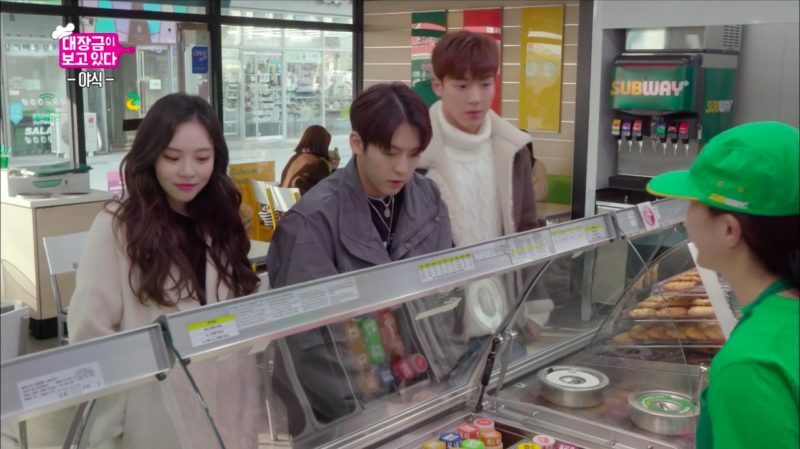 Everything comes full circle when the pair run into Jin-young (special cameo by trot singer Hong Jin-young), San-hae’s college classmate and first girlfriend, who’s now a well-known food blogger known as ‘Lemon Water’ (sounds familiar)? Old connections die hard; so it’s no surprise that San-hae and Jin-young would wax lyrical together (with Italian accents, no less) about this Italian restaurant’s tangy and nutty, yet still clean-tasting halibut carpaccio with pistachios (광어 카르파쵸와 피스타치오), and the al dente halibut tartar pasta (광어 타르타르 파스타), cooked in a sauce made from halibut broth. 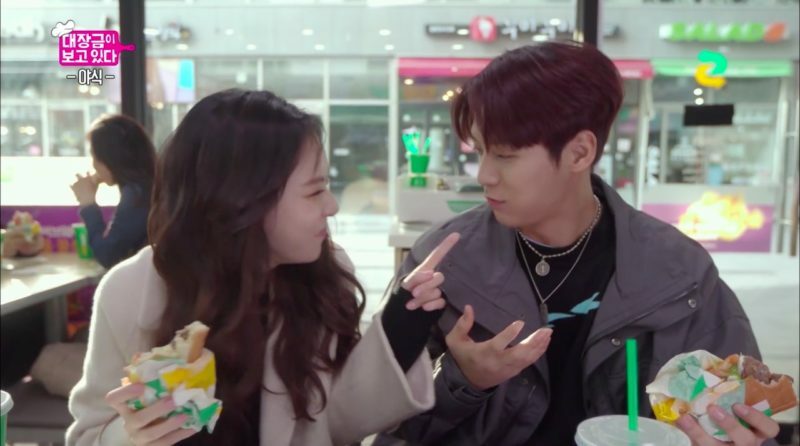 Though the previous ‘CC’ (campus couple) seemed to enjoy their meal, it appeared to leave Seung-ah with a slightly sour taste in her mouth — not because of the lemon oil, though. 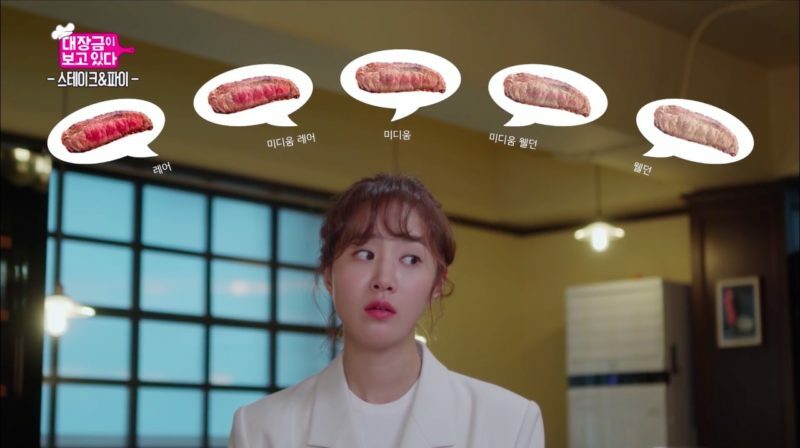 Despite Seung-ah’s prior grilled beef experience at Hibaci, having beef at a Western steakhouse was a different ball game… what should the doneness be? Cue San-hae and his steak-pertise: he orders a dry aged T-bone (드라이 에이지드 티본) with both the sirloin and tenderloin, in medium rare — since its cooking time on a hot plate has to be taken into consideration — along with sides of french fries and creamed spinach. 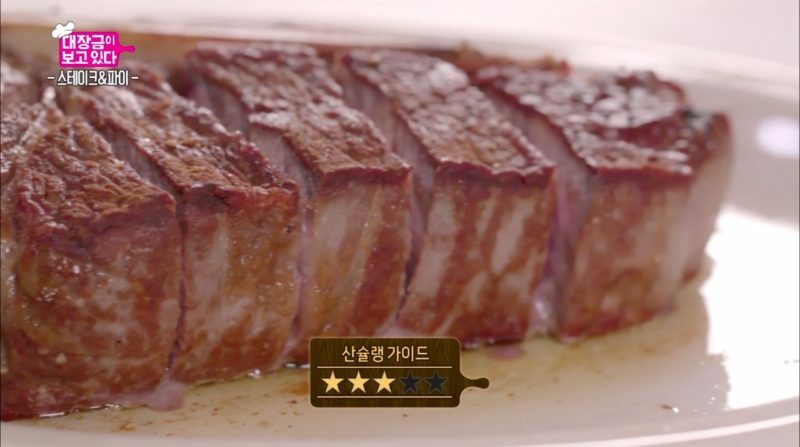 Even the order of consuming the steak should also be considered, as San-hae points out. 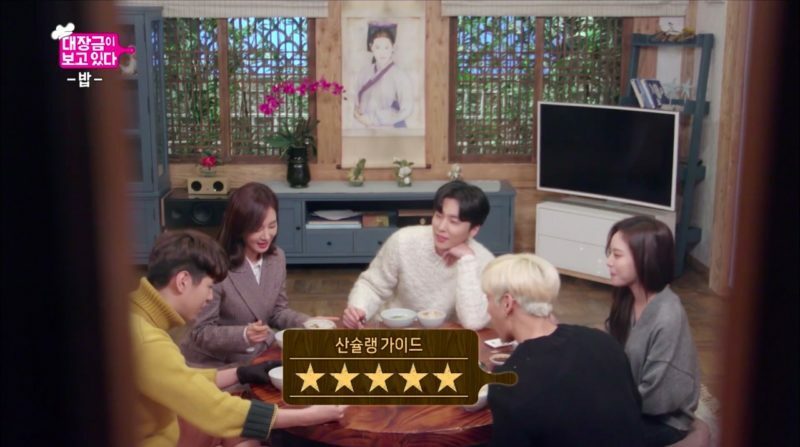 “You have to try the sirloin first, which is fragrant and chewy, then eat the soft tenderloin to rest your tongue.” Judging from their very satisfied reactions (amidst some distractions from Jung-sik’s affections), San-hae’s definitely hit yet another bucket list home run! San-hae’s choice of the chicken bulgogi (닭불고기) couldn’t have been more comforting: chicken thighs braised till tender in a pineapple and salt mixture, mixed in with a thick array of sauces, and fortified with a rich broth boiled in an iron pot. The crunchy beansprouts that the final dish is topped with adds a complementary texture, with San-hae (and Seung-ah at the other table) advising against mixing the two components. All that said (“Fireworks happening inside [my] mouth”) and eaten, there was no way San-hae wouldn’t have enjoyed that meal… right? Oh, San-hae. You’ve really done it this time, haven’t you. 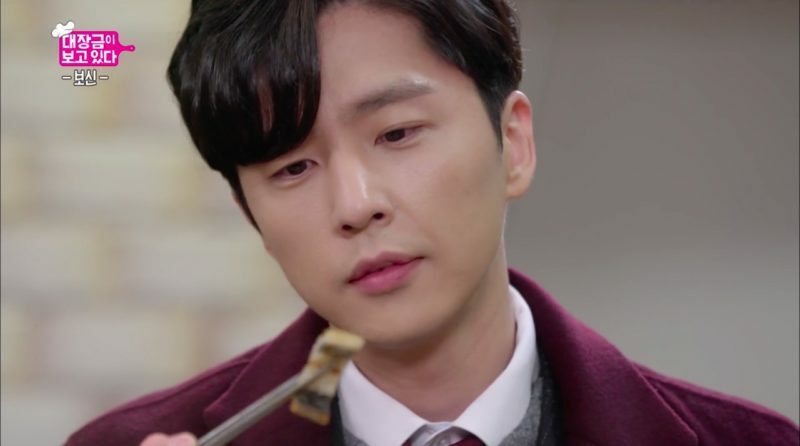 You broke Seung-ah’s heart by rejecting her confession and now you want to win her back through food? 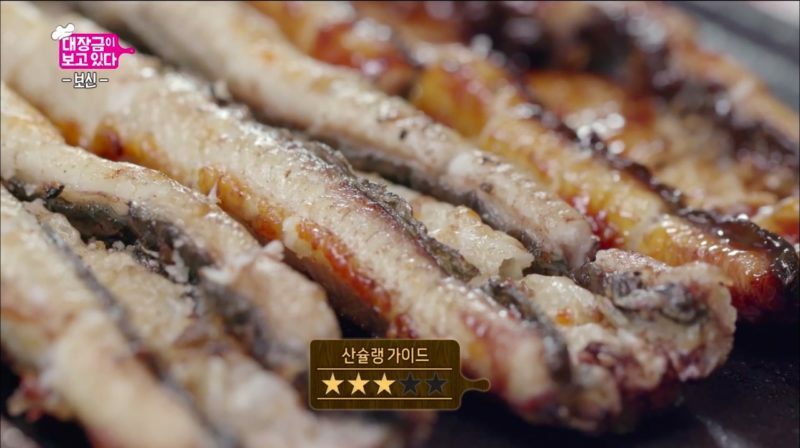 I’m not sure if grilled freshwater eel (민물장어구이) is the best way to go about it, but at least she’d benefit from the ‘health food’ you’re (indirectly) treating her to, along with the rest of the RG Motors sales team — clearly, a price you must pay for letting her go. The team got to enjoy two types of grilled eel at San-hae’s expense: salted (장어 소금구이) and marinated with gochujang, or red pepper paste (장어 고추장 양념구이). 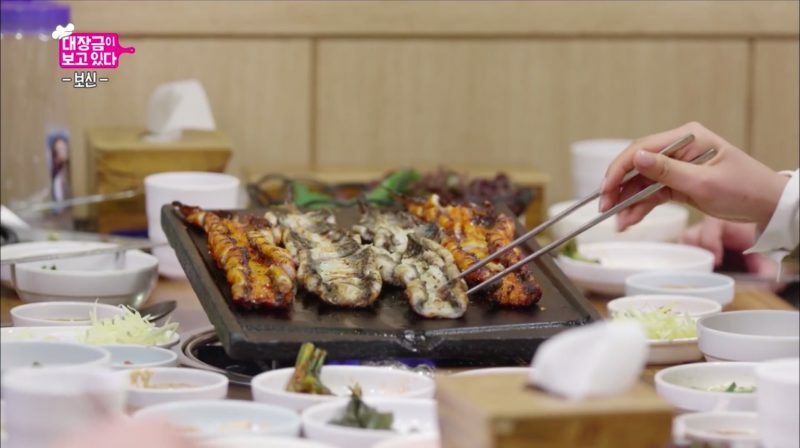 The fresh, meaty eels — imported daily from Jeolla province — are only grilled upon order, and its chewy, clean-tasting meat can be made even juicier, simply by adjusting the heat on the grill. Each piece can be eaten on its own, dipped in a healthy homemade soy sauce (that caught San-hae by surprise), or paired with the various side dishes from around the region. This must have been one meal that ‘r-eel-ly’ rocked everyone indeed, since it even made San-hae channel the late Freddie Mercury! 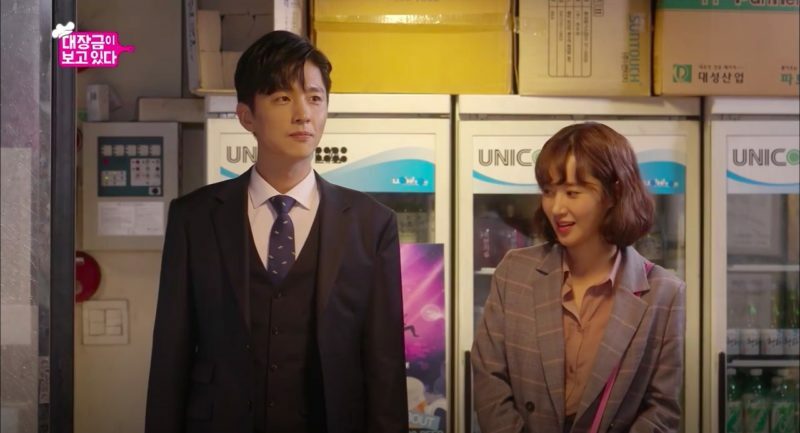 With all the drama that took place in between, and a tearful, heartfelt reunion, San-hae and Seung-ah have finally come full circle. And even more so a year later, as they visit an eatery of the same name as their first restaurant, though a completely different establishment. Together, they meet the creme-de-la-creme of RG Motor’s VIP customers (special cameo by Yang Dong-geun), with three of his own mini ‘VIPs’ in tow. Tough to talk business with children around; but Seung-ah sweetly offers to take the kids out to play, leaving it to San-hae to seal the deal. Even before tasting the cheonggukjang stew (청국장찌개 — fermented soybean paste stew), San-hae draws attention to the freshly cooked rice, and how the moistness in its texture and taste reminds him of “[his] childhood in the countryside”. 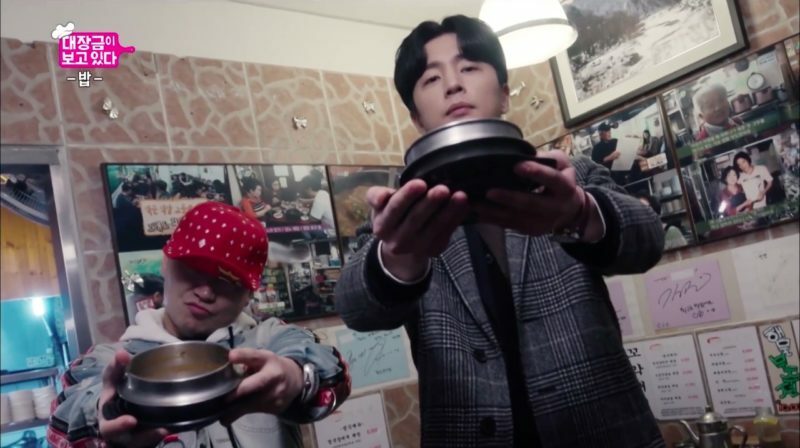 Together with the stew, boiled with stir-fried winter kimchi, it makes for quite a palatable and heart-warming combination — so much so that the duo ended up rapping about it! 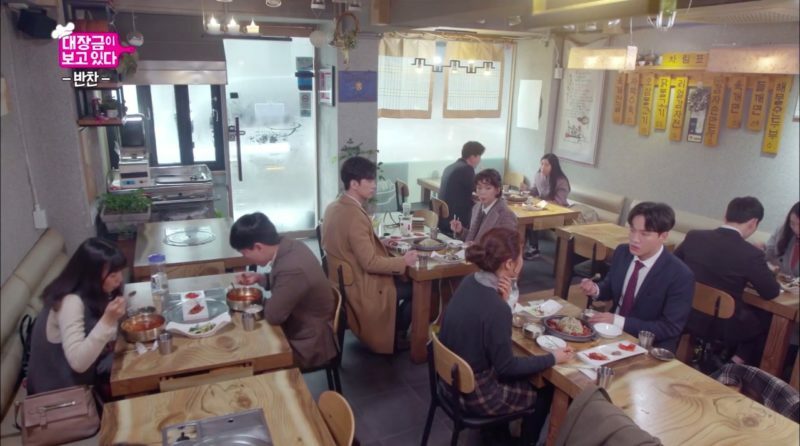 Note: No restaurant feature in episodes 19/20 (you’ll see why below) and 29-30. 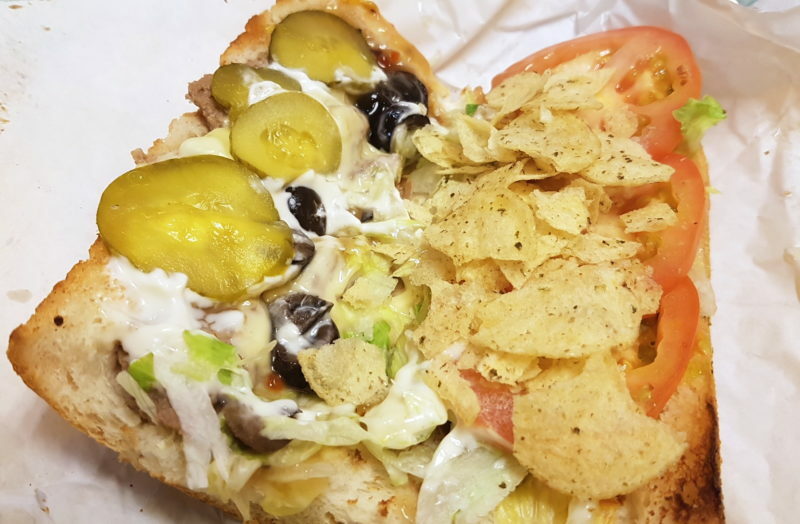 Sorry — I’m not talking about a Min-hyuk sandwich here (I wish); while this isn’t quite restaurant fare, nor is it considered a convenience store creation, this is certainly one combination that you can try at your local ‘S’ sandwich store! Beef steak, extra cheese, all vegetables (which you can customize to fit your preferences), topped off with crushed potato chips. real life Min-hyuk’s sandwich special combo! 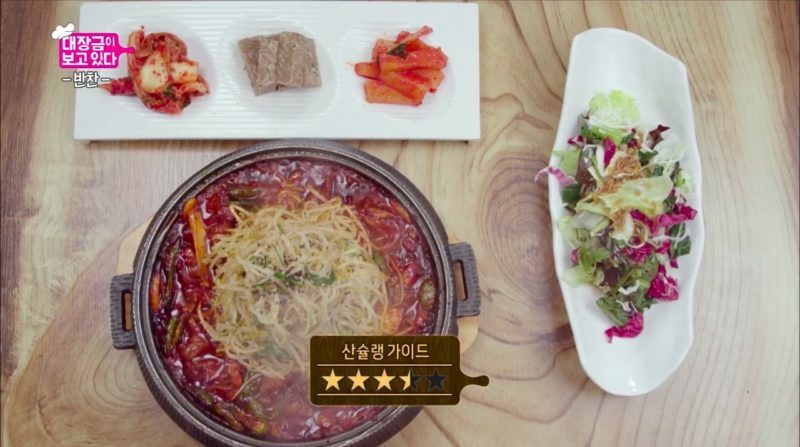 I decided to give it a go for lunch one day — and I must say that Min-hyuk (at least his character in the show) certainly holds his own with foodie creations, maybe owing to all the ‘Jin-mi Specials’ he’s had the joy of sampling. Tip: Add lots of crushed chips (I used Lays Nori Seaweed, but would have preferred Sour Cream & Onion) for a good crunch! Also note that the chips get soggy after a while, so be sure to enjoy it quickly. “There’s two types of food in this world,” San-hae muses as he enters Ilmi Kalguksu in episode 2, “The food we’ve already tried, and the food we’ve yet to try.” Well, I’m certainly looking forward to visiting some of them on my next trip to South Korea, to find out how they measure up to the ‘San-staurant Guide’! And thank you, San-hae, for guiding us through the ins and outs of enjoying our meals to the fullest, with your nuggets of culinary wisdom and appreciation. I’ll miss how you so lovingly gaze at your food.